Watch the 2017 Ladies Tour of Norway LIVE! Norway is beautiful, and of course getting to race here is a great taster of what will happen at the World Championships – although we’re down in the south-east for the Ladies Tour of Norway. It’s a lovely race, and the fourth year is part of the Women’s WorldTour – and the last parts of the road race stages are live too! Of course, the Prologue isn’t streamed, and you can find the full programme, in European CEST, here. We can follow all the race on twitter, with the #LToN17 and #UCIWWT hashtags, and with the race twitter too. There’s lots of information on the excellent race website, as well as on their instagram and youtube – and find out how the Moberg family are behind this race! Watch the 2015 Ladies Tour of Norway LIVE! It’s been a wonderful year for live women’s racing, and after Energiewacht Tour in Spring, we now have our second stage race that is streaming live, no geo-restrictions. The Ladies Tour of Norway may only have been raced for the first time last year, but it burst onto the scene with excellent social media, great video and a really fun, hard race. 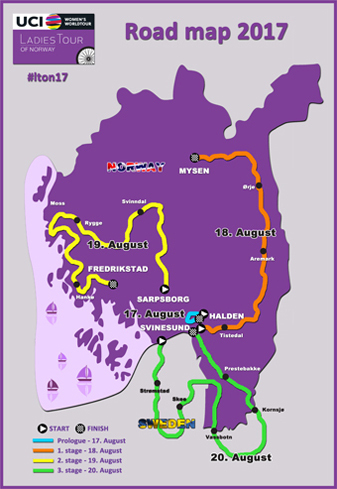 This year’s racing starts today with a city crit in Halden, then 15th-16th August is the stage race, and we’ll all be able to watch the last hour of each day! The broadcasting timetable is here – all times are in European CEST (so UK BST +1, North American EST +6, and Aussie AEST – 8 (so when the stream starts at 16:15 CEST, that’s 3:15pm BST, 10:15am EST and 00:15 AEST). It’ll be streamed on Procycling.no (possibly Norway only) and the UCI website., and on the race youtube too. If you want to follow the action until the streams start, of course there’s twitter! The race twitter is one of the best, and the official hashtag is #LToN2015. I’ve updated my live-tweeter list, and I’ll be out there too, thanks to team Hitec Products, tweeting as @_pigeons_. Feminin Magazine will be there too for some great in-depth coverage. There’s tons more information on the race website, and previews on Velofocus and Velorooms – hope you love this one, it’s very special. To stream the most Danish interview on this site (so far! ), click here. Sign up for automated updates from the iTunes store here or via our RSS feed here. Follow Christina through her twitter, website, facebook and instagram – and of course, through the Matrix website and twitter, too. I’m funded to do these interviews by my wonderful Patreon supporters, who enable me to do so much. If you want to find out how you can support me too, have a look at my Patreon page.